Sir Howard Lister said other cities are now following Manchester’s lead in regeneration and boosting the economy pointing out that the city had become a ‘poster child’ for redevelopment. 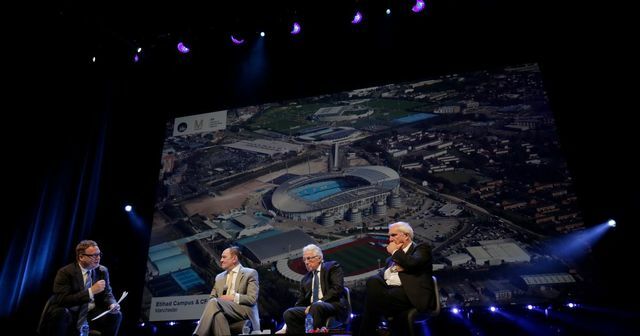 The discussion also centred around the success of Manchester Life, the joint venture between Manchester council and the Abu Dhabi United Group, owner of Manchester City FC, which is driving forward the development of Ancoats, New Islington and east Manchester. In east Manchester, the partnership has been instrumental in a £1bn deal to bring 6,000 new homes to the area. Speaking about what Manchester has learnt from its experience working with Abu Dhabi, Sir Howard Bernstein said: “What we have is confidence from our investors and developers. Confidence is the key, long may it continue. “It’s all about leadership at the end of the day. If you know that the people in charge are serious, will take political risk, make difficult decisions, are not scared to say no and then will follow through with schemes, then your level of confidence is much higher.